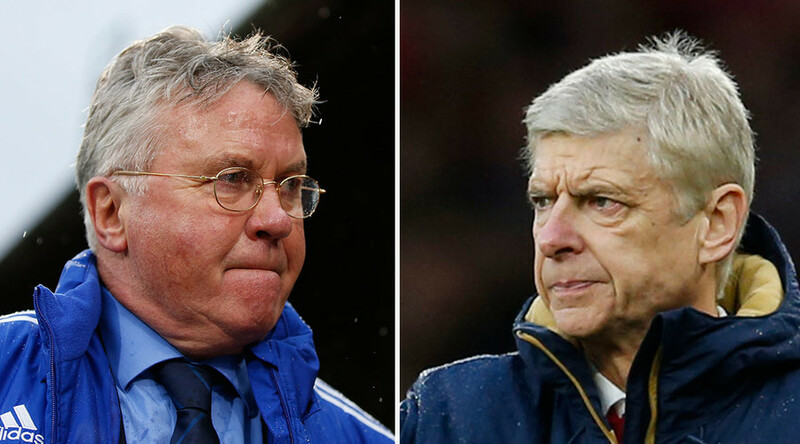 The game is not the top-of-the-table clash you would expect at this stage of the season, but when Premier League leaders Arsenal go head-to-head with reigning champions Chelsea this Sunday, sparks could fly. It has been six months of contrasting fortunes for the London rivals, with the Gunners looking like real title contenders and the Blues a fading force, virtually guaranteed to miss out on Champions League football next season. Arsenal are currently 19 points and 13 positions above Chelsea in the league table and a home victory would cement their credentials to become English champions for the first time since 2004. Mesut Ozil in particular has been in sublime form, providing a league-high 16 assists this term, while a much-improved Olivier Giroud’s 12 goals have been vital to Arsenal’s chances of ending their long wait for a league title. In contrast, Chelsea's squad look like a shadow of their former selves, with last season's star players Eden Hazard, Nemanja Matic and Cesc Fabregas all under-performing this season. Jose Mourinho paid the price for the West London side’s failings when he was sacked in December and replaced on an interim basis by Guus Hiddink. Realistically it will take a miracle for Chelsea to finish in the top four this season, despite slightly improved showings since the managerial change. The Blues have conceded 34 goals in 2015-16 to date, two more than all of last season, while their usual menace in attack has faded - despite Diego Costa recently showing signs of returning to goalscoring form. However, although Chelsea’s season is now effectively dead, and Mourinho has departed the Blues’ bench, we will still be in for a tasty clash on Sunday, as games between the teams have a history of conflagration. Earlier this season the heavyweights met at the Bridge in September, with the Blues winning 2-0 in a bad-tempered clash. Chelsea striker Diego Costa was guilty of extreme provocation and petulance, resulting in the reaction and subsequent sending off of Arsenal center-half Gabriel, while the Gunners ended up with nine men after Santi Cazorla also saw red. The players on both sides will surely remember that game, and will be keen to settle scores at the Emirates. Mourinho's sacking nullifies the bad feeling on the respective benches, but this remains a real grudge match despite Chelsea’s dramatic dip this season. Both sides are sweating on the fitness of key players, with Arsenal hoping Ozil and Alexis Sanchez can feature, having recently spent time injured on the sidelines. Chelsea, meanwhile, should have Costa available despite the striker picking up a shin injury against Everton, while Hazard could also possibly return. The 19-point gap between the London rivals is the biggest in Arsenal’s favor for 22 years. Both teams will be desperate for three points in what should be a scintillating clash, with the Gunners surely keen to add to Chelsea’s woes and ensure bragging rights in the capital for Arsenal fans.